I can’t sleep. It’s the stroke of midnight. Waking mid-sleep is becoming a common and unwelcome occurrence. One consolation is that I often wake with a song in my head but not without the added plague of too many thoughts, including the unwanted. Tonight I am fortunate to be greeted with a song. 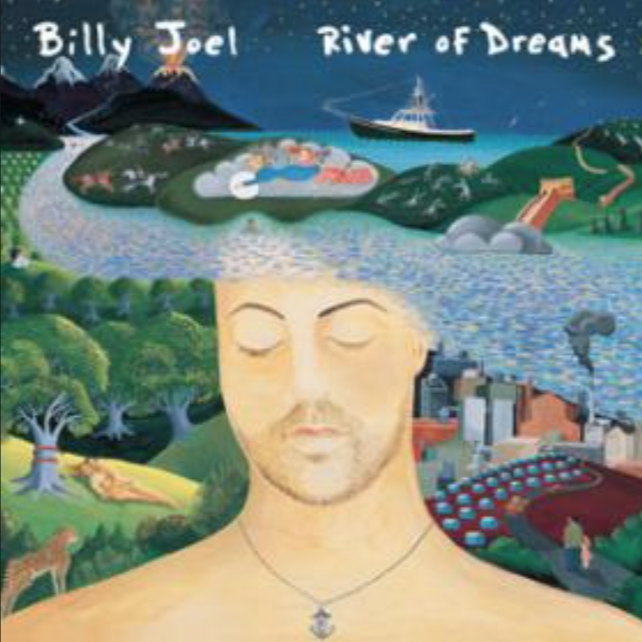 Billy Joel’s River of Dreams – perhaps a little ironic? Billy was one of my all time favourite artists when I was a young impressionable teenager easily influenced by many things. Luckily for me, my big brother loved Billy Joel and when my brother listened to anything with audio, everyone in the house knew about it! I loved Billy Joel’s lyrics. I loved the subliminal and the unconscious psychology in his lyrics. It gave me a sense of the world and Billy’s music just ‘did it for me’. Music is unlike art. Art is a little harder to decipher let alone hum along to! In doing a little research I discover there is a huge load of information on the psychology of music – general music psychology, music cognition, music therapy, even psycho acoustics! My adult, sleep-deprived brain gives me a nudge to suggest now is not the time to dive into this any further. The tune continues to escape from the upper echelons of my brain.. I stop to sip the almost-cold cup of tea I made to ponder the things I was thinking while awake in my bed with Billy’s emerging hum. In my semi-wakened state I find the ideas and words don’t come to me as vividly and fluidly as they did when I was horizontal. My thoughts immediately turn to imagining the invention of a “thoughts interpreter” or “brain dictation technology”. Billy’s cries come back to me .. This is the part of the song I most relate to. I shy away from delving into why this is and from deciphering the deeper meaning of the verse. Besides, it’s now one o’clock! I acknowledge Billy’s struggle easily though. I sense that this time of year (even this time of the morning) is one of the best times to quietly consider claiming back what might have been taken from my soul or what i know has been stolen. It’s times like these I am faced with observing the search that Billy sings about. And I am confronted with dealing with the river streams I am drifting in and wonder which of them I am flowing in – if I’m flowing at all! There is a struggle. It sits with the two people fighting the rivers in my heart. One who was devastated, angry and robbed a long time ago. The other is loving, compassionate, optimistic and creative. But which one will win the fight in my heart? “The one I feed” as B has been known to suggest, particularly when someone is in need. I take consolation and hope in those four words – the one that I feed. And God knows I need to allow myself to feed on the good stream, the good in me. My mind turns to the ending of the song and I hope that it will bring with it the sleepiness I require to get back in bed with my beloved to sleep soundly as the night intended. As I search for the last lines, B walks in checking if I’m ok. “I needed to write”, I tenderly reply and he reluctantly nods and turns back towards to bedroom. I sip the last of the cold tea, clutching hard at those four words and the remainder of the words of Billy’s song and I force myself to go to bed.